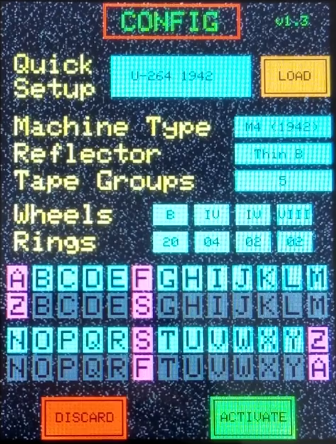 This needs to be combined with https://hackaday.com/2019/03/26/a-keyboard-for-your-thumb/ ! … now, anyone got a teeny plug-board design, or shall we leave that in software? Ha! That keyboard is my project and I was just thinking the same thing as I read the article. I thought of building one as a password generator. It would be cool to combine various projects in this way. That would be fantastic, giving the system a physical keyboard would open up more space on the screen for the lamps and rotors. I think leaving plug board in software probably reasonable enough concession for a miniature build, especially with the touch screen. Since this version already accepts input from the serial port & processes it the same as it does for input from the touchscreen keyboard, it should be fairly easy to marry these two projects this way (serially) !! Sadly, unimpressively another ‘reinvent the wheel’ project – Enigma encryption/decryption isn’t much of challenge any more nor a software/mcu-hardware recreation of a machine. I’d have been more impressed and equally comment positively if the time had been spent doing similar on one of less well known cypher units, such as the non-Enigma Morse/CW destined systems or one of the less well known teletype/FSK later evolutions like Lorenz/’Tunny’ (Lorenz became the root of most postwar TTY fsk-transmitted cypher systems (which were Lorenz much evolved and elaborated) encapsulated in those mysterious cypher boxes in embassies etc. Interestingly, there have been successful baudot and ASCII teletypes recreated with MCU’s, so a reverse engineered cypher box for such would definitely be worthy of note. How about a numbers only Enigma Z30 for the Kim Uno implemented in 6502 assembly? Chris_M1BIK: I’m sorry that you seem to have missed the primary objective of this project: to allow anyone, using readily available components (Arduino+touchscreen), to be able to have a live, hands-on experience with a historical piece of equipment, using an accurate simulation that attempts to incorporate all of the physical elements in a way that makes it easy to use & facilitates understanding of the operations that occur inside the machine. As for the other systems that you mention as “worthy of note”, we’ll be anxiously looking forward to your recreation of the non-Enigma Morse/CW system, the Lorenz/Tunny system, etc & assume that you will take the time to post for others to enjoy . . . how soon do you anticipate that you’ll make this available for the rest of us to play with ?? Here’s your genuine & personal opportunity to really impress the rest of us !! I think asciimation on youtube deserves a mention here. He has completed a working enigma machine from 3d printing and other hardware. Not many subscribers but he makes Very detailed videos that are worth a watch.